In American sculpture, Powers helped pioneer the neoclassical style, an international phenomenon that held special meaning in a country that prided itself on the classical roots of its democracy. The sculpture combines Powers's typical graceful lines and calm, noble bearing of its subject, with dramatic movement, a departure in his art. The subject of the sculpture is dressed in a detailed skirt tailored by Powers's imagination. Decorated with diamond patterning and tassels, the intricately cut skirt seems to sway convincingly as the figure runs. Powers saw The Last of the Tribes as the sculptural equivalent of James Fenimore Cooper's literary classic, The Last of the Mohicans. Like Cooper, Powers helped to promote the popular notion of the time that the American Indian was a noble figure that co-existed harmoniously in an Eden-like American wilderness but was doomed to extinction because of his incompatibility with encroaching Western civilization. The running figure personifies the American Indian fleeing civilization, a current in American culture at the time. This is apropos today as American civilization itself may be fastening its running shoes come Nov. 5. At Flickr, a relative of the sculptor's has posted a magnificent Hiram Powers gallery. His statue America (1848-50) was rejected for the Capitol because of the anti-slavery message in the chain underfoot. 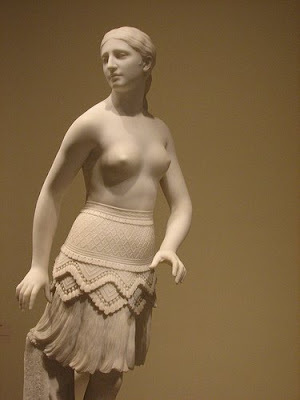 His Greek Slave (1851) was a centerpiece of the 1851 Crystal Palace Exhibition. A replica today graces Sir Basil Seal's study.